chhuri chalaye bina hi jaan lelete hain...........!!!! I know many of you might be thinking that "what's with this girl posting sad shayaris/poetry back to back, first 'gustakhi maaf kardo', then 'when I am sad' and now this......well there are so touching topics you know_one can't really write too many happy shayaris... it's soo difficult!! My fellow shayar's will agree with this right guys??? :):) Just enjoy what I write, rate my blog and leave your comments..CHEERS(don't be sad sweetums:))!!! The only thing it means that...the one who is writing shayaris's is pretty good shayar...by the way what's the female version of shayar? I think the word 'Shayar' is used for both male and female.....Anyhoo! Thank you for your sweet comment Anjan! 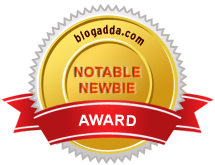 Do rate my blog at blog adda!! Very nice poem and Bushra you are a good Shayara now. The female poet is known as a Shayara. ye to gazab lines hein. yu b chhupana padta hein kabhi.